I want on every push i do to tfs git repository that the Assembly Info file (Assembly version) will change on the build process. 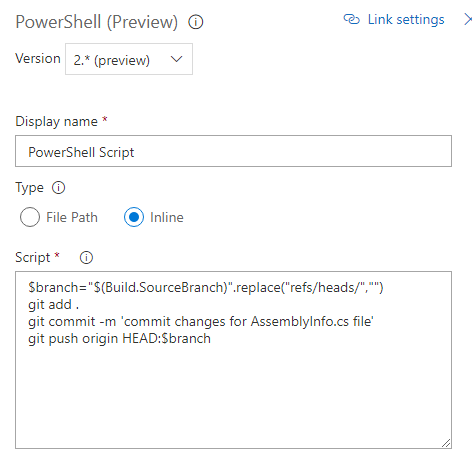 I have a task on the build process that changes the AssemblyInfo.cs files, then i want to also push this changes to the master repository so that i can pull the changes from visual studio and see that the Assembly Info source file has changed as well. 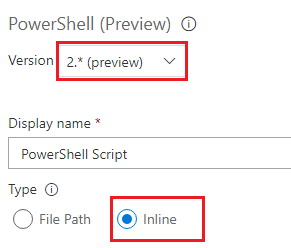 After the task which changes AssemblyInfo.cs file, add a PowerShell task with the version 2.*(preview). Now, after each build, the updated AssemblyInfo.cs file will be pushed into the TFS git repo. Not the answer you're looking for? Browse other questions tagged git build continuous-integration azure-devops cd or ask your own question.